The hardest part of cake making is the waiting…and by this I mean the long ride in the car to bring your cake to its final destination. No matter how far you have to travel, it always seems like a LONG ride. One big bump or swerve, and some serious damage can be done. 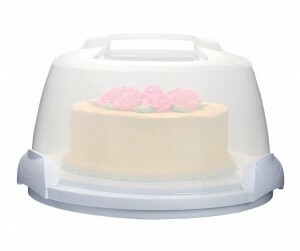 This is why I wanted to recommend two of my favorite cake carriers, to help make the transport just a little easier. I’ve only had a few casualties, and these were actually caused by having a cake that did not properly fit in my carrier. Once I bought my second carrier, I’ve had no problems. For round cakes that are under 10-inches in diameter, I love the Wilton Cake Caddy . I find it very sturdy, and I completely trust the latches at the bottom. They are heavy duty and I never worry about them opening. My only issue with this carrier is that you can’t use it for cakes bigger than 10-inches, or cakes that are especially tall. When I used it for my LOST finale cake, some of the palm trees got crushed because they were angled outward, making the cake bigger than 10-inches across. 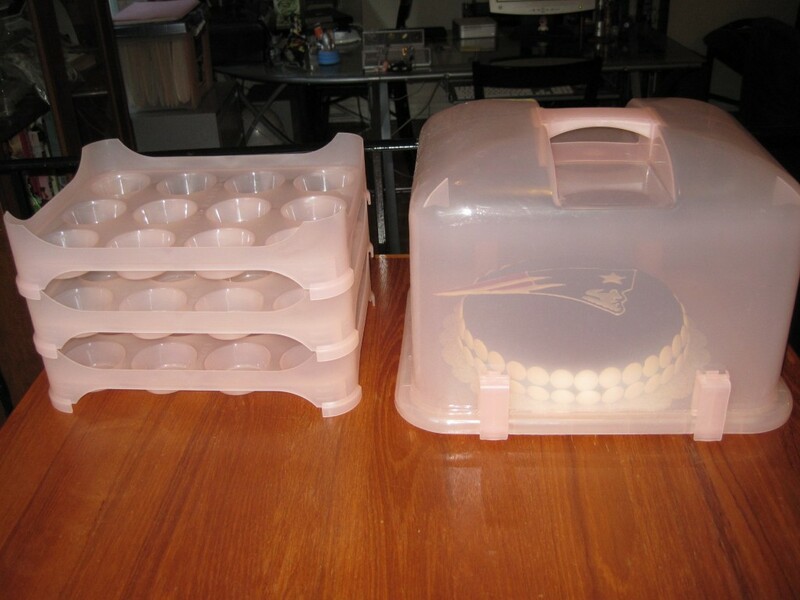 However, I got lucky when I bought a cupcake carrier, and learned that I could use it for larger cakes as well. About 6 months ago, I got into making cupcakes, and wanted a carrier specifically to transport a large amount of cupcakes. 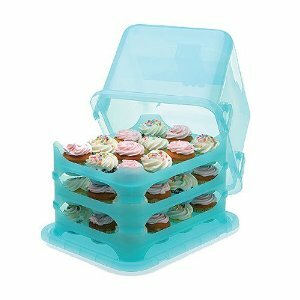 I found this Cupcake Courier 36-Cupcake Plastic Storage Container online. It was the only carrier that held three dozen cupcakes. It is also quite versatile, because you can remove the trays to hold just one or two dozen if needed. The best part is you can remove all three trays and it has enough room to fit a tall cake (up to about 11-inches high). The base is 12.5 x16″, which is a pretty good size. It comes in a bunch of cute colors, too. While my Patriots cake was small enough to fit in the round carrier, the color flow decoration hung off the side, and I couldn’t put the top on without ruining it. It fit perfectly in this cupcake courier when I took out all the trays. My only complaint with this this carrier is that the latches are a little delicate. The first carrier I ordered had a broken latch. I sent it back and got a replacement. Now the one I have has 3 very tight latches, and one latch that closes, but isn’t as tight. My advice is to always hold this carrier from the bottom, just in case your cake is very heavy. But the versatility of this carrier makes it definitely worth it. Just check the latches when you get it, because apparently they can break easily during shipping. Hopefully this will help with your cake transporting. I have one last piece of advice that is totally random… if you have a set of flares in your car, you can use it to wedge in your cake carrier so it doesn’t more from side to side. Put your carrier up against the side of the trunk or back of your SUV, and place the flares box right up against the carrier. My set comes in this heavy box, so this prevents the carrier from moving very much during the ride. This entry was posted in Kitchen Equipment. Bookmark the permalink.